If I had my way, I would have all our children (our two sons and our two daughters-in-law to be exact) and our grandchildren at our home at the same time. It is wonderful when they are all having fun together. I know that is impossible except for rare occasions. But any way we can see them, individually, kids alone, one set of grands or the other, partial sets . . . any combination is a source of joy. On a recent visit by oldest son’s wife and little ones, the weather was great for simple springtime pleasures. Here are our three granddaughters enjoying bubbles, two visiting from Georgia at our home and our Louisiana granddaughter via the blogosphere thanks to her mom’s blog The Daily Skup. 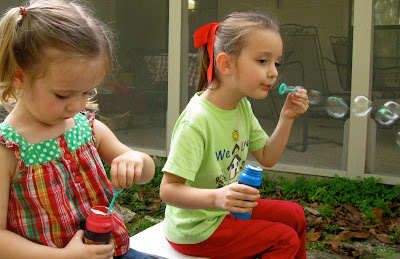 Five-year-old granddaughter Charlie produces bubbles while little sister Stella works at loading the magic bubble wand. Almost-three Stella concentrates on her bubble-blowing technique. 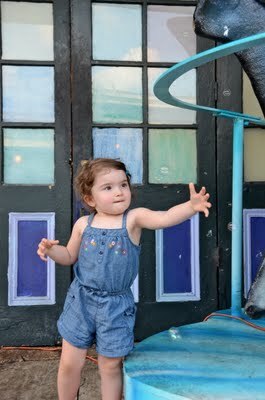 After a day at the French Quarter Festival in New Orleans, three-year-old Molly Kate summons up the energy to enjoy a bubble machine on a New Orleans sidewalk. I’m cherishing these moments while this trio still finds total delight in simple pleasures. We have a new baby "Charli" as well - Charlotte, actually. How adorable they are!! 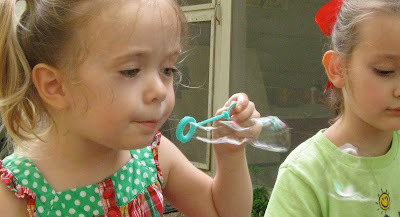 Is there anyhthing more precious or innocent than small children blowing bubbles? For every generation of children, bubbles do the trick. Come to think of it - grown ups too! bubbles are fun. shiny, iridescent, bouncy bubbles for shiny little kids. you are sensible to make the most of them while they are still little, when they grow up they soon find less time for the oldies. Precious pics of precious people, during precious times! Isn't it amazing how bubbles are timeless? I never grow tired of watching the joy on little faces as they blow, or try to catch those bubbles. Of course, these days it's all automated...bubble machines, bubble guns...I keep thinking "What next"? I just found your blog. You have beautiful grandchildren. Like you, I would prefer all my chicks under the same roof at the same time. Most of the time that doesn't work, so like you, I take what I can get!! !